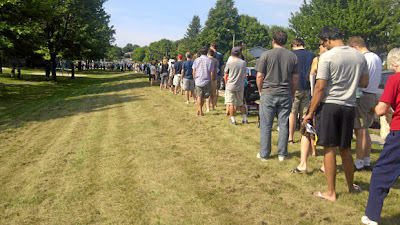 All of these people were actually lined up to try to get a family doctor in Canada. "When the man took my registration papers and said “congratulations, you have a family doctor,” I confess I had to hold back a few tears. I had just spent three hours of my Saturday standing in line (pictured above) with hundreds of other people outside a community center in an Ottawa suburb to enroll with a new family medicine clinic that is opening at the end of August. The wait was inconsequential compared to my long and frustrating search for someone to provide me with basic primary care. When I moved to Ottawa in 2005, leaving behind a wonderful doctor in Burlington, Ont., who had looked after my family for more than a decade, I had no idea how difficult it would be to find someone to replace him. I spent months searching the Internet, calling doctors’ offices and imposing upon friends for the names of their physicians – all to no avail. No one was taking patients. My own husband’s doctor refused to take me because his practice was full. So I visited walk-in clinics when I urgently needed medical attention and went without the routine stuff, including annual physicals. Then, in early June, I fractured a vertebra. It was a minor crack, as those things go. But the emergency room physicians insisted that I see my family doctor for follow-up care. And I did not have one. Which meant I had to resume the search that I had abandoned four years earlier, this time in earnest." MP: In contrast to the situation in Canada, there are sixteen primary care doctors or internists in the DC area listed on the ZocDco website who all have appointments available within the next few days (some lists openings this afternoon). HT: Pete Friedlander and David Henderson. What's amazing is that even with Canada's problems, international polls show that dissatisfaction in the US is even higher. Highest of all countries polled. And we spend twice what Canada does. This explains why despite Canada's real problems, Americans overwhelmingly want single payer or a public option. And as a side benefit it would solve the deficit problem if history is a guide. But we don't get this choice because insurance company and bueracracy in our system consumes 31 cents of every health care dollar. That's a gravy train that Obama's backers (insurance companies and pharmaceuticals) like. And so we get Romney Care from Obama, which is the Heritage Foundation solution. jon price is different from cost. doctors are 'free' in canada, but the costs are clear in that article - scarcity, lack of care, wait times. also there are high taxes, suspect quality, reduced innovation, and much more waste and inefficiency. "free healthcare" is much more expensive than free-market healthcare. It costs more in the usa, because the industry is controlled by a medical cartel that limits the supply of medical schools and doctors. ivy league medical schools turn away more than 9 out of ten applicants. Regular ones turn away 60%-40% of applicants. medical schools need to start acting like businesses, expand enrollment, build more schools, compete with each other, and accept every qualified applicant that walks through the door. Why do medical schools turn away so much business? Does walmart turn away customers because their stores are full? And they say, that there are limited numbers of residences, well if that is the most important part of becoming a doctor, medical schools need to change and improve and offer more training for doctors. Perhaps become training hospitals, and offer care at reduced prices. An available appointment is no more available than no appointment, if you cannot afford it. Hal, nobody said care in Canada is free. It's half what we pay per capita. Canada has wait time problems. You shouldn't try and prove that with anecdotes though. Look at the evidence, which I provide at my link. But the US also has wait time problems, particularly for the 50 million Americans that can't do anything but wait until it gets bad enough to go to the ER, at which point it may be too late. In EVERY CASE where the bulk of the health care is funded via the states the costs are DRAMATICALLY lower. That would lead me to believe that there's something about single payer that brings costs down. And the quality doesn't suffer overall. Sure, you can find a particular area where Canada is doing poorly or another nation is doing poorly, but overall they are doing much better. Look at the rankings of the World Health Organization. Look at the Commonwealth Fund studies. Normally buying in bulk allows you to improve costs. So for instance the Pentagon buys a lot of paper clips, so they get a discount. Wal-Mart buys in bulk and gets a discount. Canada buys prescription drugs in bulk and gets a discount. Why doesn't Medicare buy in bulk and get a discount? Because Congress, bought off by the pharmaceutical companies, saw to it that this wouldn't be permitted. Further we can't go to Canada and buy the drugs from them at a reduced price. Why not have free markets? Because it's socialism for powerful corporations when they need the nanny state to improve their profits. But free markets for everyone else. Canada also doesn't have 31 cents of every health care dollar going to an insurance company bureaucracy. Medical schools need to start acting like businesses, expand enrollment, build more schools, compete with each other, and accept every qualified applicant that walks through the door. We could have spcialized fast track schools to verify the skills and language ability of doctors trained in other countries, too. there are several reasons why that per capita spend number is not apples to apples. 1. the US is a healthcare destination. people from all over the world comes here to get the most advanced care. 2. we are much richer than canada. US household income is 25% above canadas. after tax, that gap widens still further. 3. we provide a vast number of treatments that canada does not. they tend to be the expensive ones. 4. lots of canadians come here for care. that deflates their national number and inflates ours. absolutely. but that's the result of our insurance system. the best way to rein in costs is to go to cash pay. elective procedures drop in price while insured ones soar. federal aid should be HSA cash grants, not the buffet style we have now. that would both make program cost predictable and make the procedures themselves drop in price as people bothered to price shop. "But the US also has wait time problems, particularly for the 50 million Americans that can't do anything but wait until it gets bad enough to go to the ER, at which point it may be too late." and this is ridiculous. it's a pure canard. the biggest users of ER care are medicaid patients. they go at twice the rate of the privately insured or the uninsured (whose rates are very similar). cash pay doctor visits in the US are cheap and getting cheaper. my old GP didn't take insurance at all. it was $95 to see him, you could pretty much always go same day, and you got great care. folks like walmart are dropping this price enormously. Obama Care is based on the below equation. Only the mind of a liberal can equate. i wish it were than simple. i fear the real plan is cap prices + increase demand = drive the private sector out of business. you require plans to take everyone, you require them to provide vast ranges of services and have low deductibles, then you cap what they can charge. soon, non of them can make money. they start to fail. voila! a free market failure! swoop in and create the single payer plan you wanted from the start. this whole thing is just a trojan horse for single payer. This explains why despite Canada's real problems, Americans overwhelmingly want single payer or a public option. Nope. This explains that those Americans don't know how good they've got it. Also, you're wrong. The majority of Americans don't want a single payer - which is what all the polls showed and why Obama had such a hard time shoving Obamacare down the throats of his own party. The overwhelming majority of Americans in the ER have insurance. People with hangnails show up to ERs because they don't want to bother making an appointment with a doctor and want to be seen right away - not because they don't have health insurance. Those people who don't have insurance can take advantage of free clinics or pay out of pocket or they qualify for medicaid. I know it's terribly shocking to think about paying for goods you want out of your own pocket! However, unlike Canadians, Americans have that option. For now. What Canada and other countries with socialized health care have with regard drug purchases is a monopsony. Do not advocate anti-free market solutions out of one side of your mouth and free market solutions out of the other. Methinks I'm getting used to the method of argumentation in right wing circles. Evidence free assertions that sound plausible to right wingers. That's all that's needed for evidence. So what about public support for single payer. Look to source 1, source 2, source 3, source 4, source 5. Instead of just asserting that it is opposed by the public, why not look first for some data? Do that and you'll make fewer completely erroneous claims. Obama had a hard time shoving Obama Care down the throats of his own party because what he offered was a right wing plan. He offered bald faced lies to the public while behind the scenes killing single payer and a public option. He's a corporate stooge. Tom Daschle admits that Obama promised the insurance companies and pharmaceuticals that he would block a public option in private meetings. He then went to the public and pretended he was still fighting for them. Pharmaceuticals like the present profit margins. A single payer means buying in bulk generates savings, which cuts into profits. Unacceptable. And insurance company overhead, which feeds CEO bonuses and other extravagences, isn't going to go away on the Obama plan. Yeah, people are showing up to the ER with hangnails. How do you know? Maybe you heard someone say they knew someone that saw that once. Argument by anecdote. I am a Canadian who owns a home in the US. As long as I have money, the US is infinitely preferable. I can get medical or dental care on a phone call. In Canada, I had to go to the emergency room at the hospital to get prescriptions for gout, because there were no doctors accepting patients. 3 to 6 hours later, I have my prescription. In the remote Canadian communities, most of the doctors are from 3rd world countries. Nigeria is popular. The reason? Canadian doctors graduate, and move to the US to practice. And even these 3rd world doctors are unhappy with the system. Most I spoke to, could not wait for the contract to expire (3 to 5 years), so they could go back home! So, I can get better and quicker care in the US, than in Canada, only it costs me more. No problem. How much? Check or credit card? CATO thinks WHO is biased, eh? Color me shocked. ... in his speech, the president used Alabama to buttress his call for a government insurer to enhance competition in health insurance. He asserted that 90% of the Alabama health-insurance market is controlled by one insurer, and that high market concentration "makes it easier for insurance companies to treat their customers badly—by cherry-picking the healthiest individuals and trying to drop the sickest; by overcharging small businesses who have no leverage; and by jacking up rates." In fact, the Birmingham News reported immediately following the speech that the state's largest health insurer, the nonprofit Blue Cross and Blue Shield of Alabama, has about a 75% market share. A representative of the company indicated that its "profit" averaged only 0.6% of premiums the past decade, and that its administrative expense ratio is 7% of premiums, the fourth lowest among 39 Blue Cross and Blue Shield plans nationwide. Similarly, a Dec. 31, 2007, report by the Alabama Department of Insurance indicates that the insurer's ratio of medical-claim costs to premiums for the year was 92%, with an administrative expense ratio (including claims settlement expenses) of 7.5%. Its net income, including investment income, was equivalent to 2% of premiums in that year. As the case of Medicare's anemic anti-fraud efforts painfully illustrates, less management and lower administrative costs do not necessarily mean the program is really less costly. Canadian prime minister and provincial premiers; high union officials; all go to the US for urgent, high tech care. Or they opt for private clinics in Canada. The leader of the UAW got an MRI in 24 hours, for a leg injury. The normal wait time is 6 months. Maybe these politicians understand the difference in the timing and the quality. - "Americans have better survival rates than Europeans for common cancers." - "Americans have lower cancer mortality rates than Canadians." - "Americans have better access to treatment of chronic diseases than patients in other developed countries." - "Americans have better access to preventive cancer screenings than Canadians." - "Lower-income Americans are in better health than comparable Canadians." - "Americans spend less time waiting for care than patients in Canada and the United Kingdom"
- "People in countries with more government control of health care are highly dissatisfied and believe reform is needed." More than seven in 10 Germans, Canadians, Australians, New Zealanders and Britons say their health systems need either "fundamental change" or "complete rebuilding." - "Americans are more satisfied with the care they receive than Canadians." More than half (51.3%) of Americans are very satisfied with their health care services, while 41.5% of Canadians hold the same view of their system. - "Americans have much better access to important new technologies like medical imaging than patients in Canada or the U.K."
- "Americans are responsible for the vast majority of all health care innovations." Che, the 31 cent figure is a lie because a Blue Cross rep in Alabama says his profits are only 0.6% and his administrative expense is 7%? What does he mean by administration? And does he include the costs incurred on the doctor's end? The additional staff required to manage insurance company claims, fighting with their efforts to not pay for services, etc? It's true that multi-million dollar CEO bonuses cuts into profits. That's why I'm talking about overhead, not profits. And it's not limited to the costs Blue Cross in Alabama pays. My source for 31 cents is here. Les, if you are among the super rich then sure, the US is great. But not everybody is super rich. My claim is that the poor matter as well, though I know that view isn't popular around here. The New York Times recently declared "the disturbing truth ... that ... the United States is a laggard not a leader in providing good medical care." They find evidence in a 2000 World Health Organization (WHO) rating of 191 nations and a Commonwealth Fund study of wealthy nations published last May ... the WHO rankings, the United States finished 37th, behind nations like Morocco, Cyprus and Costa Rica. Finishing first and second were France and Italy ...The Commonwealth Fund looked at Australia, Canada, Germany, New Zealand, the United Kingdom and the United States -- and ranked the U.S. last or next to last on all but one criterion. So the verdict is in. The vaunted U.S. medical system is one of the worst. But there's less to these studies than meets the eye. They measure something other than quality of medical care. So saying that the U.S. finished behind those other countries is misleading. So what's wrong with the WHO and Commonwealth Fund studies? Let me count the ways. ... the U.S. didn't score high in the WHO rankings is that we are less socialistic than other nations. What has that got to do with the quality of health care? For the authors of the study, it's crucial. The WHO judged countries not on the absolute quality of health care, but on how "fairly" health care of any quality is "distributed." The advocacy group Physicians for a National Health Program estimates that "private insurance bureaucracy and paperwork consume one-third (31 percent) of every health care dollar. And you have the nerve to write this: "CATO thinks WHO is biased, eh? Color me shocked." $70.5 billion. That is more than all of the profits of the major health insurance companies - combined! Maybe you should change the name of your blog from "Prove Me Wrong" to "Never Right". Jon: I am not super rich. Upper middle class, at best. But I harbor aspirations to join the super rich. Does that count? ... using several different empirical strategies, the authors find that in its first ten years, the establishment of universal health insurance for the elderly had no discernible impact on their mortality. They present evidence suggesting that the explanation for this finding is that, prior to Medicare, elderly individuals with life-threatening, treatable health conditions (such as pneumonia) sought care even if they lacked insurance, as long as they had legal access to hospitals. ... they find that the introduction of Medicare had no significant effect on out-of-pocket spending for those in the bottom three-quarters of the out of pocket expenditure distribution, but led to a 40 percent decline in spending for those in the top quartile. For those in the top decile, the average decline in out of pocket medical spending was $1,200 (in year 2000 dollars) per person. The authors conduct a cost benefit analysis comparing the insurance value of the risk reduction provided by Medicare with the efficiency costs of the program (namely, the cost of raising government revenue and of increased health spending resulting from insurance coverage). They estimate the insurance value to be $519 per beneficiary, or $9.9 Billion per year (again, in year 2000 dollars), a sum that would cover 45 to 75 percent of the costs of Medicare. Private health plans generally pay above costs, while Medicare and Medicaid pay below costs to hospitals and physicians. For example, in 2009, on average, Medicare and Medicaid paid about 90 percent and 89 percent, respectively, of cost to hospitals, while private payers paid 134 percent of cost to hospitals. Medicare accounts for about 42 percent of hospital inpatient days; Medicaid accounts for about 11 percent. Both shares have been increasing and thus pushing uncovered costs onto a smaller base of private payers. Yeah, single-payer is the way to go. Pathetic. do you have any idea what it costs doctors to deal with insurance companies? doctors happily pay them 15-20% of the claim value to do it. the docs get paid in 2 weeks instead of 90-180 days and don't need the back office staff to deal with the insurance companies. that should give you a magnitude of the costs on the doctor side. add in the overhead of insurance companies, processing, and the time value of the delayed payments, and that 31% number looks pretty much on target to me. Two points in response to Stossel. First, he says the quality is judged based on life expectancy. That's dead wrong. Read their criteria here. It's based on what is called Disability Adjusted Life Expectancy. Read about that here. It's a perfectly sensible measure that combines mortality and morbidity into a single metric. It is not simply life expectancy. Second he says it's judged based on being "less socialistic". That barely makes sense and it's not clear what he means. WHO says that availability matters. In other words if our technology is awesome, but only 1% of the population has access to it, that lack of availability for the remaining 99% plays a role in determining the overall quality of care and rating for a country. You might disagree, but in my world it's obvious that this is a factor. Medicare has problems. It has to operate within a quasi corporatist for profit system. So there's no question that waste and access are problems. Compare to others that have fully embraced a public option. They have better care. They have half the cost. We've solved the deficit problem and so many others. For instance suppose you would like to take some time off. Like maybe a year. Maybe you save up a few thousand dollars and you're single and you just want to ride your bike across the country. Not an option. You can't be without health care. If you develop a pre-existing condition your life is over. So you'll stay in a crappy job. Work longer hours for less pay. Your desperate to not lose your health care, and you should be. It will wreck your life. Not in Europe. Not in Canada. Further suppose you are 60 years old and you're really good at what you do. An employer doesn't want to hire you. You may be the most qualified, but you cost a lot in terms of health care. So it doesn't matter that you are good. You're out of a job. But not in Europe. Hire the best man for the job, even if he's older. But it's a nightmare, say the corporate lackeys. Funny that polls don't show that foreigners think that way. I'm the one that says overhead is 31 cents an hour. Che denies that because that's what the corporate backed AEI says and he wants to shore up their argument. I too am used to arguing with libtards. Today was a busy day and I just didn't have the time or inclination to feed links to another leftist idiot. While I think it's cute and all that you cherry picked some polls, the vast majority of the country was against single payer and Obamacare. To show just how unhappy they were, the country tossed out the Democrats for pushing it on them in the worst shellacking in decades. I don't need anecdotes. Beyond having family in Canada, I come from a family of doctors who practiced in socialist systems, in America and with the WHO. I know plenty about what people show up to emergency rooms with and I'm awash in statistics. Moreover, I've been a gravely ill patient in one of your not for profit medical utopias. Your boy Obama had to nix the single payer because he couldn't get it passed because the outrage in the country was so enormous. It may not have looked that way to you from Canada, but that's the way it was. The U.S. system is totally screwed up because it is virtually socialized. The only "clean" parts of the system are dentistry (which is often not covered by insurance), cosmetic surgery and Lasik eye surgery. In those areas, procedures are getting better and safer and costs are dropping. Patients in Canada don't wait only if they can come down here to get a procedure done and your facilities are decrepit by comparison. Hell, your MRI facilities around Toronto have huge posters hanging on the walls of what looks like a Soviet era facility begging patients not get violent with the staff. It's not the staff's fault there aren't enough MRIs, they've done everything they can. LOL! Yeah. It's bankrupt. That's a problem. So is Medicaid. So there's no question that waste and access are problems. Compare to others that have fully embraced a public option. They have better care. They have half the cost. We've solved the deficit problem and so many others. LOL!!! Check out the OECD statistics on that, sparky. Socialized medicine costs are rising faster than the U.S. Their standard of care is lower. The wait lists are long and if you want real medicine, you have to pay out of pocket. If those stupid systems worked so well, then they wouldn't need a private system along side it, would it? Yet, all but Canada has them and your own physicians are up in arms (and putting up posters begging for mercy) because they can't take care of their patients. You can't be without health care. If you develop a pre-existing condition your life is over. So you'll stay in a crappy job. Work longer hours for less pay. Your desperate to not lose your health care, and you should be. It will wreck your life. You have a very vivid fantasy life. That is not, in fact, what happens here. Even in this screwed up system. Not in Europe. Not in Canada. True. In Canada and in Europe you never lose your coverage. You just don't get treatment! I`m from Canada. I`m Canadian. What a load of bull. Nobody waits six years or even six weeks to see a doctor. There are no line ups. Those that have a job or are financially secure pay small premiums. Those that have nothing pay nothing. The degree of financial security determines what we pay. In Canada the right to medicare is a right. Canadians believe in sharing. It is how early settlers everywhere in Canada believed and how they servived and what we believe now. We believe in reality. Not everyone is born equal not anyone`s circumstances are the same. We don`t look down on people because they are unable meet their financial obligations. It is called love. Thanks for showing Gary the error of his ways. It embarrasses me that fellow Canadians are so naive. The myth in Canada, is of a strong, vibrant, egalitarian health system. Its a cherished myth among the inhabitants. There are some advantages to Canada's system. If I was poor, or suffered an expensive, debilitating disease, I would probably take Canada's health care. But as the rich, famous and politically connected folk in Canada know, you need to go the US for the best care. yes, you are correct. sorry. misread. however, i completely disagree with your idea about a solution to the problem. going to single payer will both not drop that nearly as much as it should (docs still have a terrible time dealing with medicare/aid to the point where they simply are ceasing to accept it) and it will reduce the overall availability and quality of care. single payer underpays and resists new treatments. you get rationing. it's like building public housing and making everyone live in it. the real solution if you want to reduce overhead is go to cash pay and free up the market. run it like an actual business. medicine is a technology business. costs in cash pay actually drop every year. it's the insurance that drives costs wild. once you pay premiums, it's a buffet. no other insurance works like that. imagine if your auto insurance said hat if you crash your car, you get a new one of whatever sort your auto dealer recommends. what are the chances you's get more new cars and better ones? you'd never even ask what they cost. there'd be no such thing as a kia, we'd all have BMW's, ferraris, and aston martins and a blanche to think about what they would cost. cash pay is the best system to reduce prices and to eliminate bureaucracy. everyone gets an HSA. you put money in it, you spend it yourself. going to the doctor need have no more overhead than buying a bagel. medical assistance comes in cash grants, like foodstamps, not carte blanche as it does now. if someone suggested giving the poor/old amex black cards to use at any supermarket they wanted to buy whatever they want to eat, you'd call that insane. they'd eat lobster and drink '52 margeaux. the programs costs would go up by 10x overnight. but that's exactly how medi works. that's how single payer works. having high end "insurance" with high deductibles (5-15k) for real emergencies (like getting hit by a bus or some such) is one thing. that's how insurance is supposed to work. you can handle that actuarialy. but to make insurance a buffet is insane. that's what's causing our cost spiral. the answer is not "let everyone into the buffet", it's have people spend their own money and reintroduce the price signal. with any good or service, you are doing well to capture 2 of 3 from good, fast, cheap. single payer systems are lucky to get one. many, like the NHS in the UK, manage to get zero of 3.
the US is good and fast. medicare exists only by leeching off the private sector. they underpay significantly for pretty much everything. medicaid is worse. more and more docs are refusing to accept the coverage every day because they lose money on it. shift the whole nation to such a plan, and costs per patient will spike or docs will just go out of business. i switched to a GP who does not even accept private insurance. it was a fantastic decision. it's cheaper, faster, and better service. The article provides no link to any study that supports this assertion. The real question is whether or not government run systems are administered more efficiently than private ones. The evidence suggests that they are not. Not against single payer. Against Obama Care. Obama Care is not single payer. You're absolutely right that people opposed Obama's right wing Heritage Foundation plan, which in fact is just Romney Care. Because it didn't include a public option. You right wingers need to face the fact that Obama is a right wing President. He spiked single payer and a public option in order to provide a corporate give away. Your boy Obama had to nix the single payer because he couldn't get it passed because the outrage in the country was so enormous. You offer assertions. I offer evidence. Tom Daschle tells us that Obama worked behind the scenes to kill single payer. The only "clean" parts of the system are dentistry (which is often not covered by insurance), cosmetic surgery and Lasik eye surgery. I don't disagree with that. Third party payer in a for profit scheme is the worst of all worlds. I'm not actually a fan of huge government. But my thinking is that you have to be practical. I'd support doing away entirely with the insurance profession, using insurance for what it is really intended for. Catastrophic illness. Otherwise pay cash. That would be a huge improvement. But that's not something that private insurance companies and pharmaceutical companies want. And they own Washington. So our options are limited. We could move to single payer. Much cheaper, better quality, preferred by the public. Or we can do what Obama did. Mandatory purchase of crappy for profit insurance. Or we can go with status quo, which means a continued and unsustainable deficit increase, with less and less access for the poor. I see no way of achieving a cash only system with the strangle hold insurance companies presently have. LOL!!! Check out the OECD statistics on that, sparky. Socialized medicine costs are rising faster than the U.S. Their standard of care is lower. The wait lists are long and if you want real medicine, you have to pay out of pocket. If those stupid systems worked so well, then they wouldn't need a private system along side it, would it? I've already provided the statistics. We know it costs about half. We know the quality is better. If what they are doing includes some private care on the side, fine. Let's do that to. Let's do what works instead of continuing on an unsustainable path. Che is back with his anecdotes. He heard of someone in the news that waited too long and died. I suppose if I found a person in the US that couldn't afford routine care and as a result they died this would prove that Canada is better than the US.